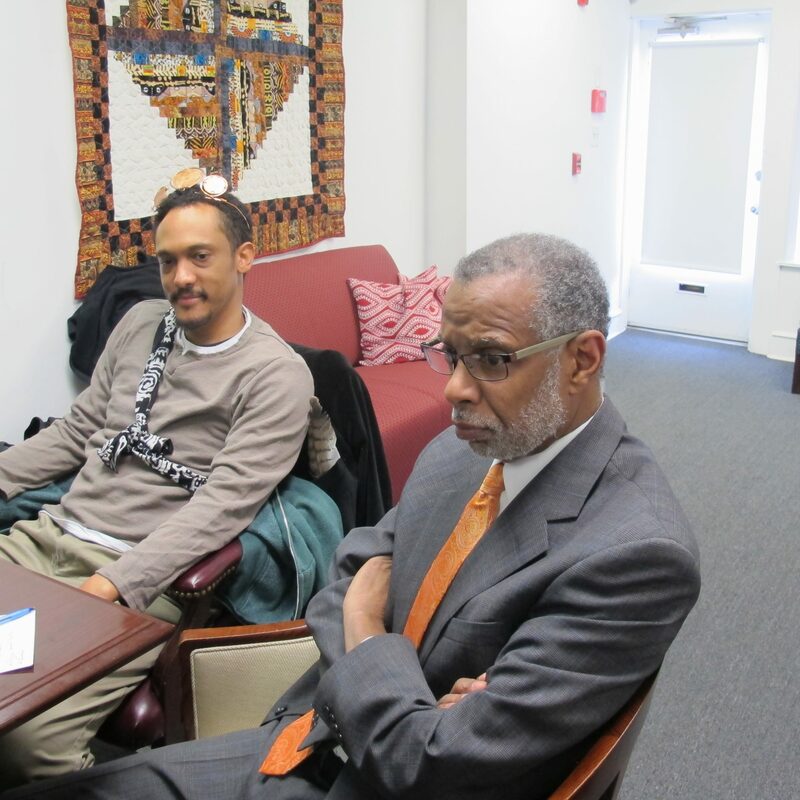 State Sen. Art Haywood, D-Philadelphia, listens to his constituents lobby him about renewable energy proposals. Lobbyist, lawmakers entwined in complex relationship: Is it influence peddling, or essential? State Sen. Art Haywood, D-Philadelphia, listens as a group of his constituents lobby him about renewable energy proposals. On the day of the Governor’s budget address last month, Amtrak’s 7:25 Keystone service from Philadelphia’s 30th street station to Harrisburg filled up with lobbyists on their way to the Capitol. PennEnvironment’s David Masur was one of them. Once the train pulled into the station, a line of men and women in suits trudged through the days-old snow to ply their trade — influencing and, some would say, educating lawmakers about the hundreds of issues the Legislature grapples with each session. Masur wasted no time. Right away, he spotted state Rep. Gene DiGirolamo, a Republican from Bucks County. Masur stood at his favorite spot, what he calls the mini-rotunda, just outside the cafeteria. He stopped state Sen. Judy Schwank a Democrat from Berks County, and thanked her for co-sponsoring a proposal he’s pushing that would mandate Pennsylvania transition to 100 percent renewable energy by 2050. Schwank says she gets approached by lobbyists like that all day long. There are more than 1,200 registered lobbyists in Harrisburg. Some work for firms, which take on multiple clients and represent different interests. Often, former lawmakers or regulators serve this role, using their old relationships for leverage. Some, like Masur, work specifically for a company or nonprofit. Schwank used to work for a nonprofit herself, and she says they’re outgunned. Schwank’s colleague, state Rep. Greg Vitali, (D-Delaware), used state lobbying records to calculate the gas industry spent $5.2 million last year in lobbying lawmakers. He says that gives the industry too much influence. StateImpact calculated that the environmental groups together spent about $300,000 in 2017. Masur knows he’s outspent, but says his job is to build relationships and be a resource. One of Masur’s most formidable opponents agrees. Rob Boulware, a lobbyist for the gas driller Seneca Resources, said that early in his career he was given a key piece of advice. Boulware is standing outside legislative chambers, which fronts up against a balcony. Looking down below the Capitol dome is the capitol rotunda, or lobby, where, of course, the lobbyists gather. “Here’s your picture right there. Thus the term,” he said. He runs into state Rep. Pam Snyder, a Democrat from southwestern Pennsylvania, a shale gas region. Snyder gives him a hug. Boulware says it’s unfair to compare industry lobbying dollars with just the environmentalists. Unions, he says, also spend a lot on lobbying. And while that’s true, it’s difficult to know, for example, how much a particular union spent to advocate for the shale gas tax, as opposed to other issues. He said the teachers’ unions spent a lot of dollars trying to get a severance tax passed as a way to bolster their pensions. Seneca Resources Rob Boulware at one of his company’s drill sites. Boulware says relationships are key to his job, whether it be leveraging the expertise of his company’s staff or working to forge relationships with lawmakers. The Pennsylvania State Education Association does support a severance tax. But PSEA spokesman David Broderic said their efforts in favor of a shale gas tax are a fraction of what they spend on other issues important to teachers like standardized tests, pensions and school funding issues. And, he said, there haven’t been any proposals to use the gas tax for teacher pensions. Boulware says some days, it’s hard to know what his impact is. He sits in on committee hearings and listens closely. He carries around thumb drives with facts and figures, in order to print out sheets to quickly answer lawmakers questions or help them during a floor debate. Boulware says he makes friends with everyone so that if his boss wants a meeting with someone, he can get it. But most importantly, he views himself as an expert who educates lawmakers tackling about 2000 bills a year. “Some people view the role of a lobbyist as necessary and others somehow feel we’re a hindrance, and those that choose the latter just don’t understand the role in politics,” he said. Boulware says lawmakers or legislatures could not exist without lobbyists. Delaware County Republican state Sen. Tom Killion agrees that lobbyists are helpful. For an answer as to the influence the industry dollars have, it may be useful to look at the shale tax. About 70 bills have been introduced to tax the industry beyond the current impact fee that levies a per well fee. None has passed. But lawmakers like state senators Killian and Schwank, and lobbyists like Masur and Boulware, agree that despite the power and money that any industry brings to bear, constituent lobbying can have even greater impact — if it’s used. A week after lobbying the capitol, PennEnvironment’s Masur took a handful of constituents to state Sen. Art Haywood’s office in North Philadelphia. The group wants Haywood to get other lawmakers to sign on to a bill that has a goal of making the state carbon neutral by 2050. Haywood said he worries about the influence of campaign contributions from PACs, whether it be from for-profit industry or nonprofit unions. Rep. Vitali calculated the industry, for example, spent about $8 million on campaign contributions in the last 10 years. And money like that can’t be matched by individual constituents. Yet Haywood stressed to the group that their voices matter. He told them that he’s willing to talk to lawmakers, but that lawmakers don’t necessarily listen to each other so much. The group says they have.